The STA Helping Hands Ministry announces our Ninth Annual Thanksgiving Food Basket Drive! The donated basket items benefit families without their own parish, as well as those served by the Diocese of Charlotte Catholic Charities. are needed for Thanksgiving. These items will be gathered, taken to the Diocese, and the Diocese will assemble into “complete” baskets and distribute to families in need. 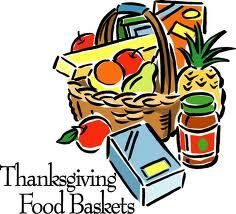 Please leave basket items in the Narthex the weekend of November 12th and 13th. For more information regarding the baskets or helping with the collection and delivery, contact Angelique Mitchell, (704) 236-7846 or email stathanksgivingbaskets@gmail.com.